The Cook County Coyote Project is a comprehensive study of coyotes in Chicago metropolitan areas. Also known as the Urban Coyote Research Program, the study was initiated in 2000 as a non-biased attempt to address shortcomings in urban coyote ecology information and management; the Coyote Project is still underway. 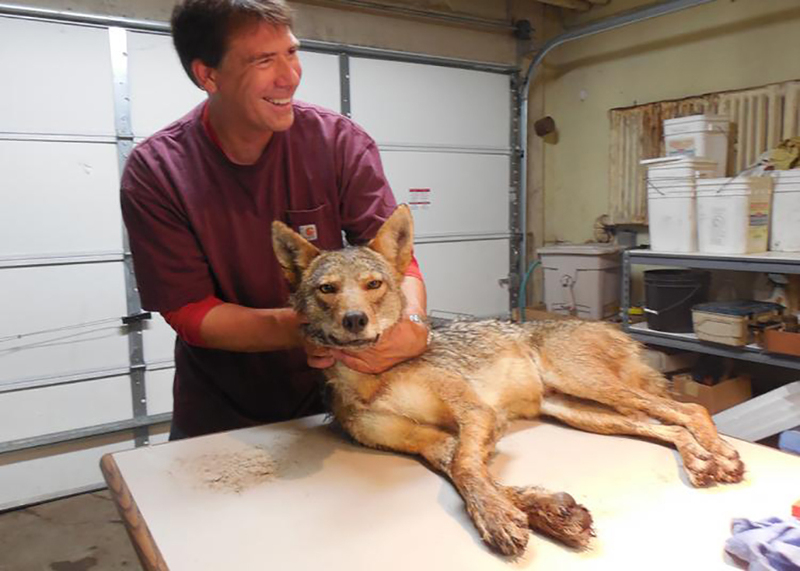 With the help of many key agencies, a continuous subset of coyotes is live-captured, collared, and released at their capture site. Coyotes are monitored to understand how they live in urban areas and how they interact with other wildlife, domestic animals, and humans. This website provides details on the study, information about urban coyotes, how to avoid conflicts, and a snapshot of the lives of some of the animals being tracked. By providing the public with this research, the project aims to initiate the first step of coyote management — public education. By becoming aware of coyote ecology, people can understand the difference between true threats and coexistence. It is important to stress that our relationship with coyotes is directly affected by our behavior. Coyotes react to us, and we can foster mutual respect or a lack of respect through cues we send to them. In this research, our primary interest is in observing and only in very rare occasions do we test manipulation of coyote behavior. One criticism of this research program is that it focuses on the overall population and ignores the situation of "problem" coyotes. What has been learned from all the animals in this study, however, has provided the framework to manage both cases of conflict and those without. The issue with studying animals reported as nuisances is that often, enough information on the situation cannot be obtained prior to someone having the animal removed, if the animal could even be safely trapped for study. There are also many levels of nuisance, with the term itself being highly ambiguous; only a very small population of coyotes appears to be causing actual conflicts with humans. The Cook County Coyote Project gives perspective to media reports and neighborhood complaints that tend to focus only on coyotes causing trouble. Of the 446 radio-collared coyotes in a variety of urban habitats, only 14 have been reported as nuisances by members of the community. While there are undoubtedly complaints we are not aware of, this number is likely a good indication of what the majority of coyotes are doing, which is staying out of our way. In those communities experiencing heightened conflicts with coyotes, it is worth a review of this website, and specifically that of the consultations resulting from conflicts in Broomfield, CO. It is important to examine what individual people are doing in order to interpret what individual coyotes are doing. Many suburban areas unknowingly provide excellent habitat and other resources to coyotes; identifying these things may help reduce bold coyote behaviors by ensuring proper management of attractants. Negative interactions with coyotes can be intimidating if not dangerous, and steps should be taken to be sure issues are not ignored. Using community-wide reporting procedures can be an effective way to track conflicts to specific areas or animals. Prevention in this case is critical, since lethal removal, if deemed necessary, is only a patch to cover a much deeper problem. We hope you find answers to your questions on this website. If not, or to provide feedback on a new sighting of a collared coyote in your area, please feel free to contact us. Thank you for taking the time to learn more about the wildlife in your community.